I hope you found some time to relax and refresh your soul this weekend! 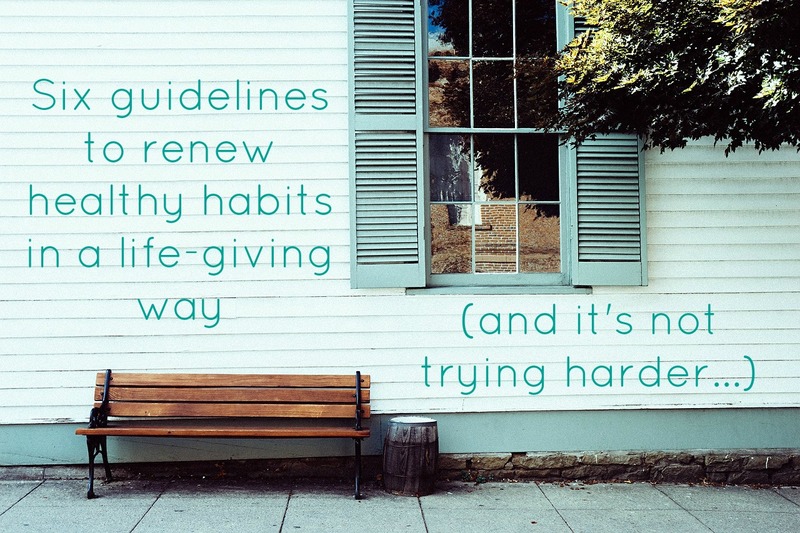 Weekends provide a chance to breath a sigh of relief and recover from the busy pace of life... for many, this includes relaxing our diligence in maintaining healthy habits. As a recovering perfectionist, my gut reaction to weekend breaks in excellent self-care is to just. try. harder. when Monday stares me in the face. It usually starts out quite innocently, with the adoption of a new goal or motivation that looks positive, but when approached in my own strength, actually kills my soul. As a friend likes to ask me, how's that workin' for you? The answer is, it doesn't work, at least not for long! Taking a look at the words of Christ or the writings of Paul will clearly explain where our power for living comes from as believers - and it's not from within ourselves! What I have discovered is that accepting grace for my failures and imperfections will fuel me in a way that bootstrapping never will. 1. Realize our worth is always in Christ, not in our performance; we cannot live godly lives unless we accept his lavish love. 2. Acknowledge the grace of God as our power for living (verses here, here, and here). 3. Refuse to compare ourselves to others (or even other seasons in our own lives!). "Comparison is the thief of joy." (free printable to enjoy and be reminded). 4. Treat ourselves with grace and kindness. 5. Find strength in God + Christian community to start over. 6. Thank God for the growth and victory he has allowed in our lives previously. As I think back on my weekend, I feel pretty good about the 5k we completed, but not so great about the decent bit of ice cream I ate (and thoroughly enjoyed) afterwards, or the fact that I didn't get any cleaning, meal planning, or budgeting done this weekend like I had hoped. But you know what I did do? I experienced the grace of a Father (and a husband) who love me no matter how well I perform. Accepting that grace and rest filled up my heart, and because of that, I am confident that I can face this new week, which includes daily care for the temple of the Holy Spirit (my body) that I have been gifted. May the free grace of God empower you to love and live for him with all your heart, soul, mind and strength this week!